This To Die For Carrot Cake recipe receives rave reviews for it’s unbelievable moistness and delicious flavor! 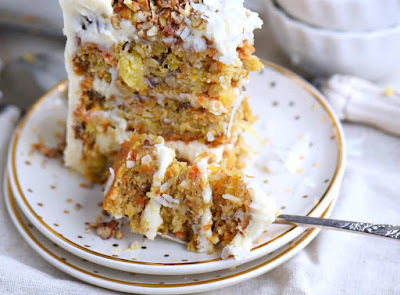 Truly the BEST CARROT CAKE you’ll ever try! So easy to make and as an added bonus, there’s no oil or butter. I know this cake will quickly become a family favorite! This To Die For Carrot Cake receives rave reviews for it's unbelievable moistness and flavor! Truly the BEST CARROT CAKE you'll ever try! So easy to make and as an added bonus, there's no oil or butter! I know this cake will quickly become a family favorite! Combine #1 ingredients. Add #2 ingredients. Stir in #3 ingredients. Bake for 35-40 minutes for the 9x13 and 9-inch pans and 25-30 minutes for the 8-inch pans. You're looking for an inserted toothpick to come out clean. The frosting recipe can be doubled if you are planning on piping a border and adding a lot of frosting decorations to the top of the cake.